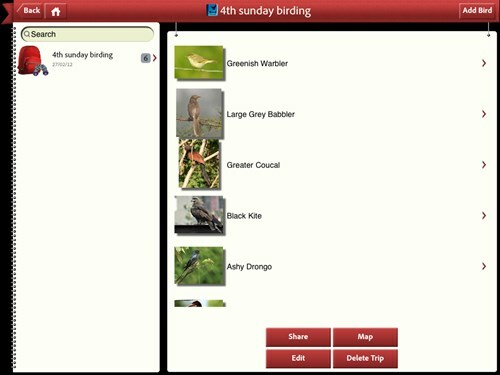 Nature Magnified: Review of BirdFieldGuide – A field guide app for birdwatchers on Android/iOS. 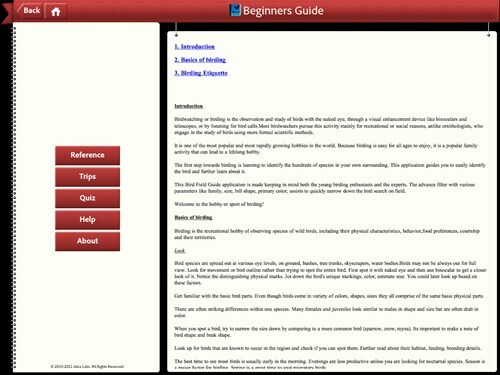 Review of BirdFieldGuide – A field guide app for birdwatchers on Android/iOS. In this digital age, bird watching has transformed itself from the days of the binocular and notepad into something more. Modern bird watchers are equipped with all sorts of electronic gadgets, such as digital SLRs, telephoto lenses, compasses and GPS equipment. One thing lacking was the digital field guide and now with the advent of the mobile smart phones and tablets even that has become a reality. Being in North America, there are such apps such as Audubon Birds, iBird Explorer Pro, National Geographic’s Handheld Birds, Peterson Birds of North America and The Sibley eGuide to the Birds of North America. 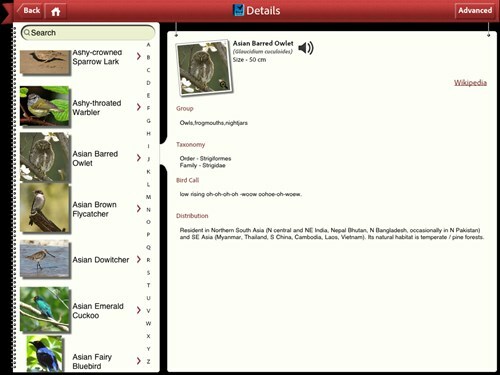 Being in India though, I wanted something that was more Indian in content and I found one such app in BirdFieldGuide – which describes itself as a comprehensive hand-held digital field guide to the Birds of South and South East Asia, covering both resident and migratory birds and includes information for over 1200 bird species with scientific classification, detailed species description like diagnostic identification factors, range distribution, habitat, field behaviour and nesting & migratory patterns. I have to say, it is a rather unimaginative name for obvious reasons and at least a hint that it is India specific could have been more helpful. A free version of this app is available both in the Android market, (now Google Play App store) and iTunes store. The free version limits your search to a daily limit of 5 birds per day. I have since purchased the full versions of both the iPad version and the Android phone version, which costs a very reasonable 100-150 Rs (depending on the version). It has since then been made available for the Blackberry Playbook. also. When you install the app, on Android it also asks you to install Adobe air, which is annoying, but once that is installed. it should work fine. When you start up the app you are greeted with an interface menu with different choices. The first of these – Reference is a confusing term. It should have been “Field Guide” or “Birds”, for it leads to a database of all available birds. 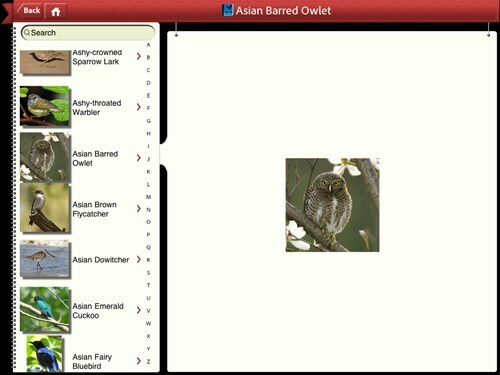 The Reference tab takes you to an impressive collection of birds in alphabetical order. You can select each alphabet in the side tab to limit your search. Furthermore, there is an advanced search tab, which is the most brilliant feature of this app. 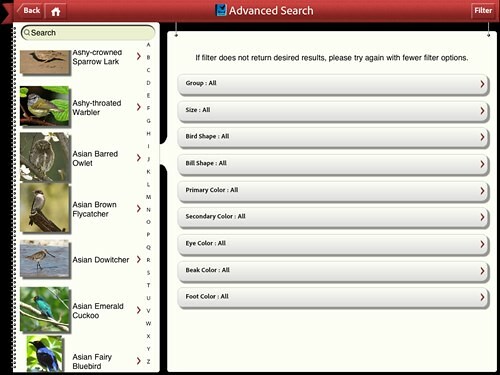 Clicking this, brings up a detailed selection menu to help you narrow down your search for an unknown bird. If all you know are say, the bird’s colours, and the bill shape and of course the size, you can considerably narrow down your search targets into those that fall within these characteristics. 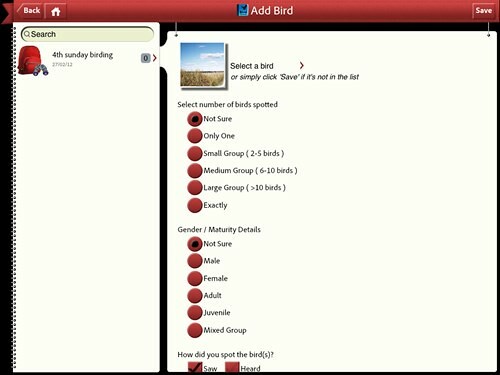 When you have found your bird, you can click on it to bring up a detailed page with more information. While some pages do have detailed information, others were sorely lacking in it. You do get an option to listen to the bird call (if that's available). But there are no maps showing the distribution and the description is often very sparse. Some birds have no more information than just the taxonomy. This is where the app truly needs to improve. 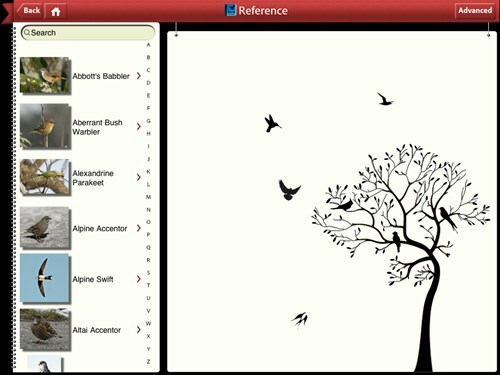 The i-phone and i-pad versions,comes bundled with all bird images and bird calls. 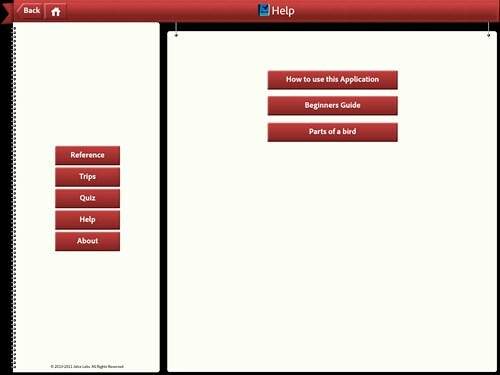 In the Android device,you will need to do a one-time download of the bird images and calls from the Help menu. This is due to the file size restrictions on the android apps in the store. Once this has been downloaded, the internet is not essential for it to work. The images though were not very detailed, but it is commendable that so many birds have been made available in photographs. 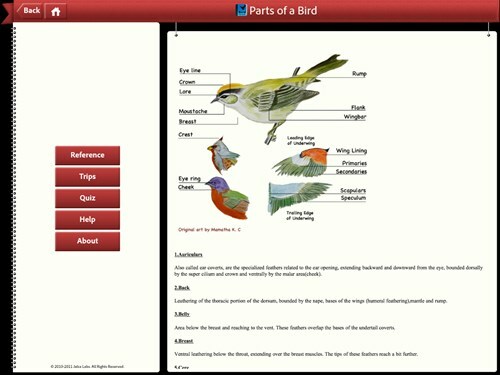 The Help menu, other than providing instructions on using the App, has a useful Beginners guide and an illustrated description on the parts of a bird. These sections will come in handy, especially for the novice birders who start out from bird photography and then move into birding as a hobby, or if you want a quick reference of the described parts in the text. Another useful feature, which could have been a killer, but hasn’t been fully executed to perfection is the ability to make a list of birds seen on a trip. A very good concept which I believe every birding app should provide. 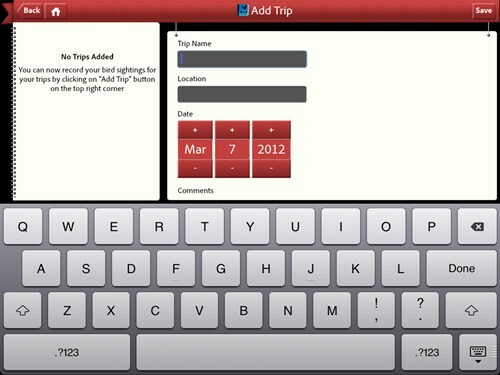 You can add a trip with name, location and date of the trip. You also have the option to map the location of the trip. This however, never worked for me. I added the birds after the trip and when I tried to map the trip, it opened up Google maps with the birds tagged to my home location and not that of the trip. There was no option to change this. 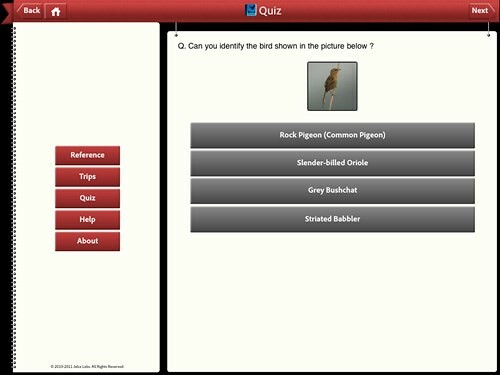 You can add birds one by one, selecting the bird from the exhaustive list available in the apps database. You can also select the number spotted and the gender/maturity details and whether you saw or heard the bird. Here I think the creators missed a trick by not being able to input notes, and custom numbers. Also what would have been great is if it provided the ability to map each bird to a location rather than just for the entire trip. 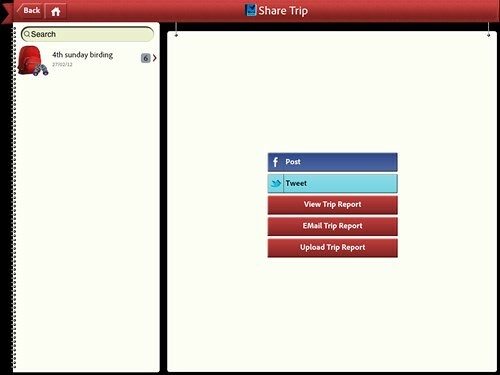 Finally, in this age of social networks and sharing, the app provides you with the ability to post your trip details to Facebook and Twitter. 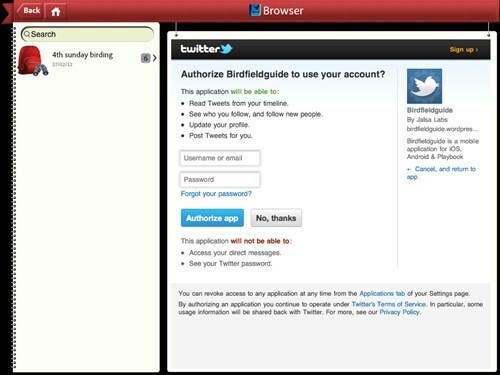 Clicking on this, asks you to allow the app authorization by opening the authorization page within the app itself. This is a fantastic idea, but unfortunately, it just didn't work no matter how many times I tried. However you do have the option of emailing the trip report and this did work without a flaw. It would be useful to generate such reports to send out to birding groups and friends. Finally, there is also the option of uploading the report to a central repository. While this is good, I have no idea where this is going and that is a huge negative. If I want to give off the information the least I should know is where it is going to. You do have the option of going back to your report on the phone/tablet and editing it. However, this information is not synchronised between your devices. 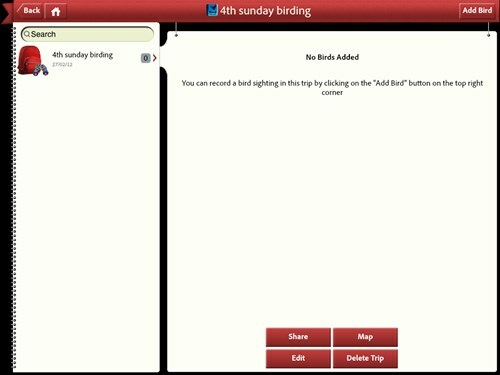 Also, it is not stored in the cloud, therefore, if you lose the app or the phone …all your trip reports will be gone..
Another interesting but trivial feature is the Quiz tab, which provides you entertainment when you cant do real birding. A very handy app that is sure to catch the interest of tech savvy birders, providing a convenient alternative to the log book and heavy field guide. However, it doesn't replace either the log book or the field guide and needs to go a long way before it can stake claim to being the ideal option. It requires more detailed descriptions, maps etc and should provide ability to GPS tag each bird by location. The share option should be improved to work with social networking sites. Finally, it is most essential to have the app sync data between devices and/or store this information in the cloud. For now though, it is the only Indian bird app that I am aware of and it provides a handy reference guide on your phone, when you may not have with you, a detailed field guide. Given the very reasonable price point I would say, if you are a birder with a compatible android or iOS device, get this app now. If you are unsure you could always play around with the free versions first. 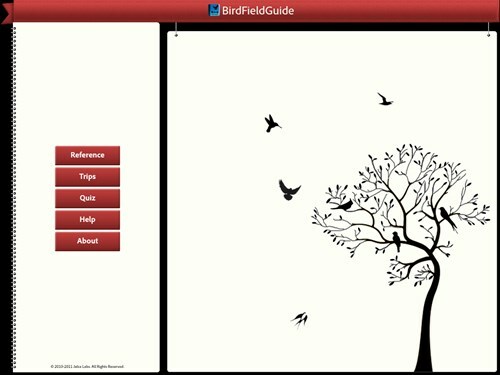 A video of the BirdFieldGuide in action from the creators of this app.